THE SIKH NUGGET: Bhai Kanhaiya the original Red Cross. Bhai Kanhaiya the original Red Cross. The Punjab Government, the Shiromani Gurdwara Parbandhak Committee and the Delhi Sikh Gurdwara Management Committee may not see eye to eye on most issues politically, but when it comes to Bhai Kanhaiya (a disciple of tenth Guru, Guru Gobind Singh) all stand united. All three of them are demanding the recognition of his services to mankind in the International Committee of Red Cross (ICRC) charter and literature. Besides, all the three have independently written to the ICRC, which celebrates the International Red Cross Day on May 8, to recognise and register the services of Bhai Kanhaiya who initiated the concept of first aid and medical assistance and protection to the wounded in the battlefield 200 years ago. 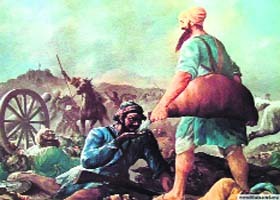 He served water and provided first aid not only to the wounded Sikh soldiers, but also to the enemy. The same concept was later adopted by Sir Henry Dunant during the war of Solferino in 1859 and it became the basis for the Red Cross movement. The SGPC wrote in a letter to the Secretary General of ICRC: "The philanthropic principles of the great hero are being followed by various missionary organisations in India. The SGPC, which is an apex body of the Sikhs, requests you to introduce the Bhai Kanhaiya Ji Mission to the ICRC and also to register Bhai Kanhaiya's selfless service to humanity in the ICRC literature." The SGPC letter reads that the values and ideals followed by Bhai Kanhaiya, which are being observed and followed till date by the Bhai Kanhaiya Mission, should find mention in the ICRC charter and the international body should include this information of the Guru's disciple in literature of the Red Cross, Red Crescent and have it incorporated in the International Humanitarian Law. According to Prof Bahadur Singh Sunet, president of the Bhai Kanhaiya Mission, the body is involved in spreading the principals followed by the devout Sikh who served under both Guru Teg Bahadur and Guru Gobind Singh. It runs day care centres, dispensaries, diagnostic centres, old age homes and holds blood donation camps. Besides bringing honour to all Indians living across the globe, the recognition of Bhai Kanhaiya would help strengthen the concept of serving the humanity, international brotherhood, love and peace, Prof Sunet says. As Dunant's ideas led to the creation of world's greatest voluntary relief organisation in 1863, which was also incorporated in various international humanitarian laws, Bhai Kanhaiya services, who brought this concept some 200 years before Dunant, should also be recognised, he feels. Meanwhile, the Punjab Government, too, has written to the Geneva-based ICRC that the Red Cross and the basic tenets of Sikhism were the same: service to humanity, equality, brotherhood, love and peace. It has also pointed out that a decade ago the Punjab Health Department had directed all civil surgeons to ensure that the portraits of Bhai Kanhaiya were hung in all emergency wards of civil hospitals and emergency wards be named after him.